The Martlets were missing All-Canadian Mariam Sylla, who led all players in the Réseau de Sport Étudiant Quebec conference entering the game, and Dianna Ros who led the league in assists. Despite the losses, the Martlets demonstrated why they are considered one of the best teams in the country as they defeated the Stingers 64-49. It was McGill’s third straight win since the beginning of 2016 and they now have a 6-1 record. Eadie mentioned that although McGill was missing a couple of their best players due to injury, the team stepped up to compensate. McGill’s forward Jennifer Silver who scored 15 points and collected nine rebounds and Alex Kiss-Rusk, a former Virginia Tech centre who scored 14 points for the Martlets, adding 11 rebounds along and four blocks. Even though Concordia fought punch for punch early in the game, they found themselves trailing 35-26 at halftime, a deficit they were never able to overcome. “We really did not play well in defense today, we got to be better on rebounding if we want to beat McGill,” said Concordia star forward Marilyse Roy-Viau who scored 17 points and grabbed seven rebounds in the loss. Only one Stingers player scored more points than Roy-Viau in the contest, as forward Richelle Gregoire scored 18 points along with six rebounds and two assists. Stinger guards, Tamara Pinard-Devos and Aurelie D’Anjou Drouin combined for five points all game. 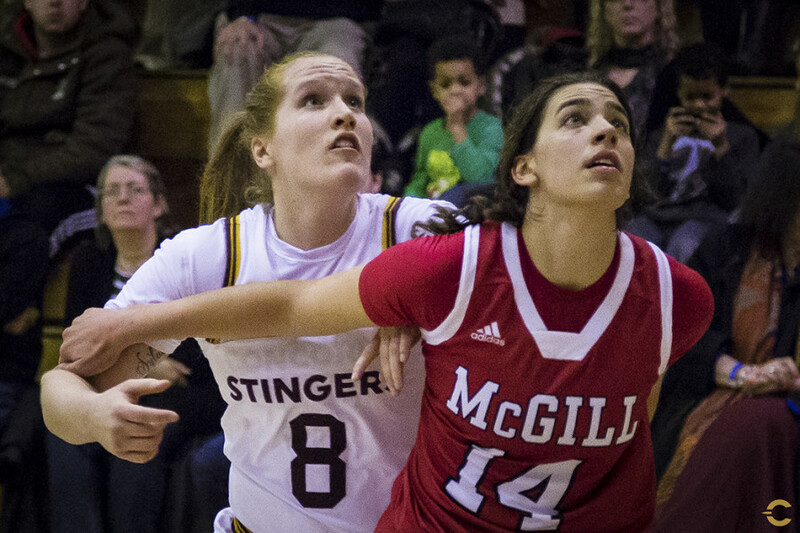 The Stingers will look to defeat their crosstown rivals this Saturday at 1 p.m. at McGill.